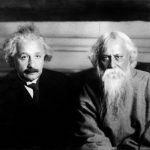 Although Arjuna knew that Krishna was his friend and the Supreme Personality of Godhead, he was puzzled by the various forms exhibited by Krishna. Therefore he asked further about the actual mission of this devastating force. Eventually all the brahmanas, kshatriyas and everyone else are devoured like a meal by the Supreme. This form of the Supreme Lord is the all-devouring giant, and here Krishna presents Himself in that form of all-devouring time. Except for a few Pandavas, everyone who was present on that battlefield would be devoured by Him. Arjuna was not in favor of the fight, and he thought it was better not to fight; then there would be no frustration. In reply, the Lord is saying that even if he did not fight, every one of them would be destroyed, for that was His plan. If Arjuna stopped fighting, they would die in another way. Death could not be checked, even if he did not fight. In fact, they were already dead. Time is destruction, and all manifestations are to be vanquished by the desire of the Supreme Lord. That is the law of nature. 11.32 The Lord said — Kala (Time) is the calculator which calculates (Kalayati). Calculating the end of the lives of all those under the leadership of Dhrtarastra’s sons, I am causing their destruction. Fully manifesting Myself with this fierce form, I have begun to destroy the hosts of kings. Therefore, by My will, even without you, namely, even without your effort, all these hostile warriors under the leadership of Dhrtarastra’s sons, shall cease to be, i.e., will be destroyed. Being thus humbly beseeched the Supreme Lord Krishna partially revealed His absolute and ultimate position in this verse and the next two in comparison to material existence beginning with the words kalo’smi loka declaring that He is terrble and intrepid time the conqueror of all and is on the battlefield to destroy all these mighty warriors. 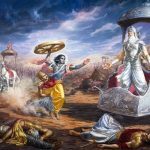 Lord Krishna reveals that even without Arjuna slaying them, they will cease to exist do to Lord Krishna terminating their life span by His force of time. Lord Krishna destined that all the demoniac forces on the Earth were collected together in the guise of kings, princes and warriors in the Kaurava and Pandava armies shall perish relieving the Earth of its burden. The word kalo means time and includes containing and terminating as well as the embodiment of eternal wisdom and the perennial principles of the resplendent Supreme Lord Krishna. The word kalo has as its root the word kala which is described as container, a binder, an integrator, as wisdom and as a provider of all desires. This same word is utilised to refer to the Supreme Lord. In the Moksa Dharma or Mahabharata there is a conversation between Bali Maharaja and Indra as follows: O Indra you are praising yourself before one who is bound by the shackles of time which is verily the power of the Supreme Lord Krishna who is of dark, lustrous hue and who binds the beings of this world and once having bound them directs their coming and goings by His intrepid potency of time. The Bhagavat Purana states: Lord Krishna synonymous with time draws the minds of all beings to Himself. The word pravriddho meaning great denotes completeness in its entirety since the beginning. 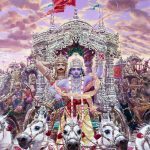 The Bhagavat Purana states: From the Supreme Lord Himself the eternal cosmic truth manifested and this is the great eternal event from ancient antiquity. Pra in pravriddho refers to the Supreme Lord and propitiation to Him is eulogising His holy names. The Bhagavat Purana states that the Supreme Lord is never born nor does He ever die. Neither is He subject to growing up or any other modifications as He is complete in all respects. The Moksa Dharma states: The rupa or form of the Supreme Lord is completely transcendental and divine, never subject to dimunition and expansion. If the Supreme Lord is never modified by the performance of any action how can there possibly be on His part any self- endeavour? 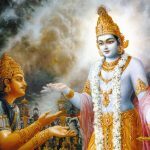 The Supreme Lord is capable without any effort, in a blink of an eye of loka-ksaya-krt or destruction of all the worlds. The word api is used to convey the message that accept for Arjuna’s brothers and a few others all the warriors of the Kauravas and the Pandavas will be annihilated by each other. The word pratyanikesu means the opposing armies on both sides and that is why it is spoken in the plural sense. The Supreme Lord Krishna being thus requested to explain the reason for manifesting such a frightening aspect of His visvarupa or divine universal form states kalo’smi loka-ksaya-krt pravrddho meaning He is all powerful time destroyer of all the worlds. 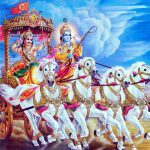 By Lord Krishna’s desire, imbued with His power and might, time itself will destroy all these armies arrayed in battle even without Arjuna participating in the fight. The Kaurava army along with their commanders such as Duryodhana, Bhishma and Drona will not survive and will all be slain. śrī-bhagavān uvāca — the Personality of Godhead said; kālaḥ — time; asmi — I am; loka — of the worlds; kṣaya-kṛt — the destroyer; pravṛddhaḥ — great; lokān — all people; samāhartum — in destroying; iha — in this world; pravṛttaḥ — engaged; ṛte — without, except for; api — even; tvām — you; na — never; bhaviṣyanti — will be; sarve — all; ye — who; avasthitāḥ — situated; prati-anīkeṣu — on the opposite sides; yodhāḥ — the soldiers.